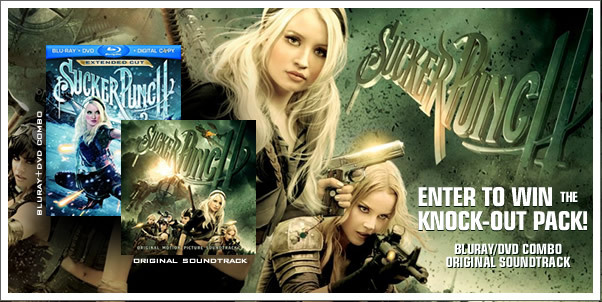 You can win both the Blu-Ray/DVD Combo (Extended Cut) + Original Soundtrack! AND - you can enter as many times as you like on all three channels (blog, twitter, and Facebook) to increase your chances of winning! Winners will be selected at random from all qualifying (ie. non-bogus, genuine) comments, and retweets. The contest will close on midnight, June 29,2011. Winner to be announced on July 1, 2011. Contest is open to US residents only. Close your eyes. Open your mind. Engage in a spectacular fantasy adventure when “Sucker Punch” arrives onto Blu-ray Combo Pack, DVD and Digital Download June 28th from Warner Home Entertainment Group. From critically acclaimed director Zack Snyder, “Sucker Punch” is a visually stimulating suspense ride about a girl and her unbelievable journey to freedom. The Blu-Ray Combo Pack includes an action-packed Extended Cut featuring an additional 18 minutes of footage and an immersive Maximum Movie Mode hosted by director Zack Snyder. 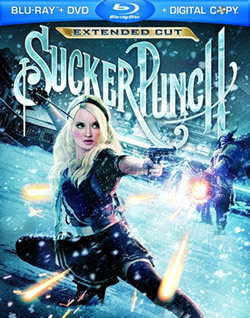 “Sucker Punch” features an ensemble cast of young stars, including Emily Browning (“The Uninvited”), Abbie Cornish (“Bright Star”), Jena Malone (“Into the Wild”), Vanessa Hudgens (the “High School Musical” films) and Jamie Chung (“Sorority Row”).